The following was contributed by T. Alan Armstrong. You will understand toward the end the importance of running this column this week. Check out the photo and if you see Bob and Ann, tell them "hello" and give them your wishes. Drum Corps International has a set of "Super Fans" that thousands of people know, even if they don't know them by name. Bob and Ann Sullivan have been drum corps fans since the early 1970s. The have attended all but one of the DCI World Championships held since 1973. Annie missed that one in the 1980s due to being hospitalized, but insisted that Bob go on without her so she could hear all about it when he returned home. Bob and Ann have never met a drum corps they didn't like. Bob first learned about the activity as a child. He told me about getting a new bicycle and riding around his neighborhood in Niagara Falls, Ontario, so proud of his new transportation. While out riding, he heard some horns and drums playing, so he decided to investigate. He came upon the Niagara Militaries, a senior corps. He sat and watched the practice for hours and became hooked at the age of nine, fascinated by the incredible sound and by the fact the corps could march and play at the same time. Bob remained a fan through the years. Several years after his introduction to drum corps, he attended his first junior drum and bugle corps show in Toronto where he had the chance to see the legendary Troopers. He said he was most intrigued, however, by a "little corps" playing this "new style of music." He thought they were something special and wanted to keep his eye on them. That corps was the Santa Clara Vanguard. Bob introduced Ann to drum corps in the summer of 1972 at the Bluegrass Invitational in Kentucky. They arrived early and set out to watch several of the corps. They were looking for some shade from the summer heat, so they settled in to watch one drum corps horn line that had found some shade for their brass rehearsal. They watched the young instructor as he worked his way through the music and were enthralled with his passion and talent and the incredible sound he got from his horn line. That instructor was a 22-year-old Jim Ott, a future DCI Hall of Fame member. Ann was now as hooked as Bob had been that day in Canada. There is only one thing in life more special to Bob or Ann than drum corps, and that is their obvious love for each other. They will celebrate 36 years of marriage later this year and Bob told me every minute has been a blessing. They have traveled all over the country and befriended thousands of members, staffers, directors and other fans. Their genuine enthusiasm for the activity and constant positive attitude about life in general and drum corps specifically never fails to bring a smile to the faces of everyone they encounter. The two have befriended legendary drum corps figures like Jerry Seawright (Blue Devils founder), "Pop" Ott (Jim Ott's father and director of the Commodores), and Freddy Martin (Spirit of Atlanta founder) who said: "There are simply no finer people in this world than Bob and Ann Sullivan. They have been friends of mine since we met in the 1970s. They aren't just fans of a drum corps, they are fans of all drum corps, and fans of what the drum corps activity does for people." I had known Bob and Ann for several years without really "knowing them" when I marched in the Spirit of Atlanta in the 1980s. They would always show up at a few Spirit rehearsals during "everydays" each year and Freddy Martin would always make sure we played Jim Ott's "Georgia" for them. We would always see them at various shows around the country and they never failed to stop by and say "hello" to several of us, even learning names and remembering faces, as they did for multiple corps. Ann was diagnosed with end stage liver disease and was in very ill health last year, but still found a way to get to the DCI World Championships. Watching her as the Madison Alumni corps performed was possibly one of the most rewarding parts of the trip to Championships for my wife Ginger and I. Her enthusiasm and obvious joy as she watched these guys perform in spite of her severe illness was one of the more amazing things I've had the chance to witness in more than 25 years around the activity. Bob tells us that drum corps is like "medicine" for Ann and there is very little if anything that will keep her away. This year, Ann was too ill to attend the DCI Southeastern Championship regional event in Atlanta, and Bob told us that it was the hardest thing he'd ever done to leave her at home that day. The next day, after all the other corps had moved on toward their next show, Bob and Ann traveled up to Chattahoochee High School to watch the Blue Devils rehearse. Just like so many other corps through the years, the Blue Devils and horn instructor Van Matthews were gracious to let them sit in and enjoy the afternoon with them. Van even ran a few special segments just for Ann and Bob, giving Annie the "medicine" she'd missed the day before at the Georgia Dome. 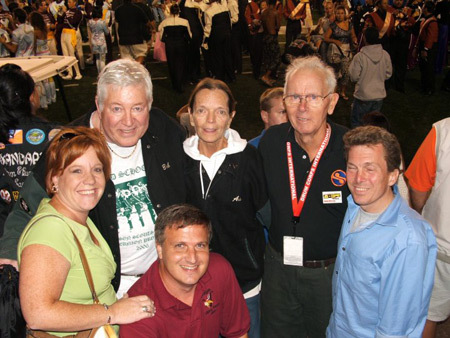 "Pops" Ott and Whitney Eure at the 2006 DCI World Championships. As I write this, they should have arrived in Pasadena for their annual pilgrimage to the DCI World Championships. Our love, prayers and hopes for a great trip and an incredible championship week go out to them both. If you see Bob and Ann, be sure to give them a hug and let them know how special they are to this entire activity. As Freddy Martin so simply stated "There are simply no finer people in this world than Bob and Ann." Ginger and I along with thousands of others would certainly agree.